This weekend I had my in-laws and my mother over for tea after a lunch to make up for the fact that they couldn’t come to my baby shower. I wanted to do something a little special, and I’ve been craving an autumn-spiced cake, so I thought I’d make a cake. 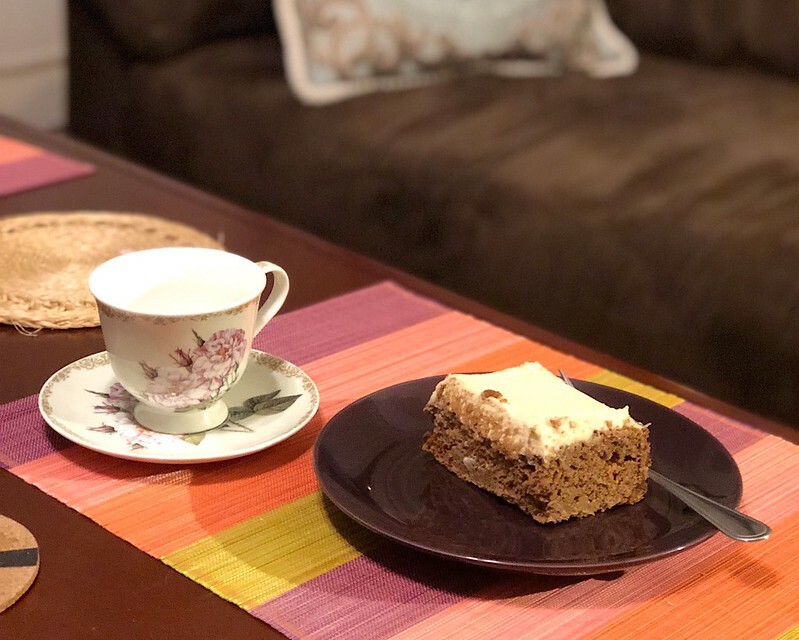 No sooner had I had this thought, than I received an email from the Nourished Kitchen with this beautiful recipe for a maple-sweetened harvest cake with a maple frosting. Unfortunately, I don’t have an electric mixer, so making a Swiss meringue buttercream was out of the question. I discussed it a bit with Jenny on social media and decided that the best course would be to make a whipped maple cream cheese frosting. 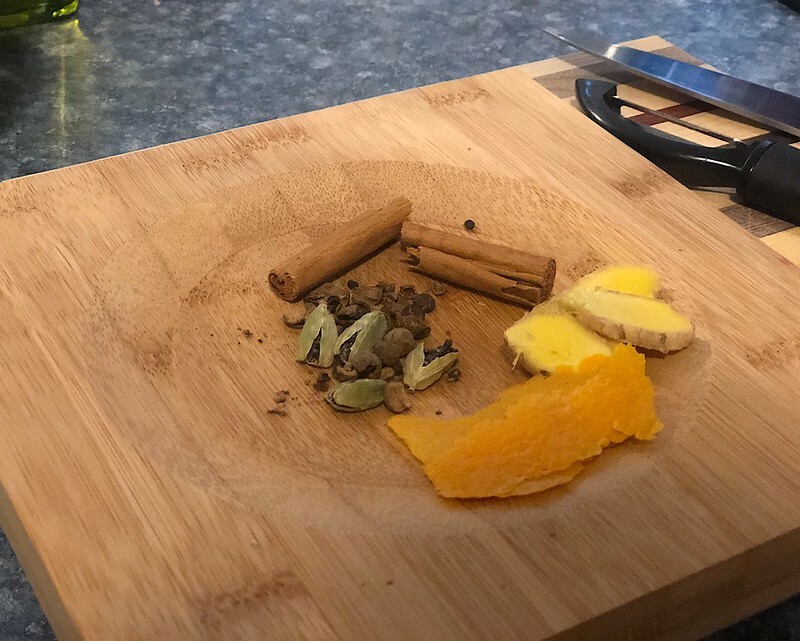 Because my mother-in-law and my mother are both careful about caffeine intake, and my mother-in-law loves the spices from masala chai, I thought I’d make a home-blended spice tea to go with the cake. The afternoon was lovely and everyone enjoyed the cake. In fact, as soon as my in-laws left, my mother-in-law text me asking for the recipes for both the tea and the cake. While I gave her a general idea of how I made both, I thought I’d post the official recipes, with my substitutions and alterations for the Nourished Kitchen recipe, for posterity. Heat oven to 350 degrees and grease an 8″ square pan and line it with parchment. Whisk together the flour, spices, baking soda and powder, and salt. In a large bowl, whisk together the eggs and maple sugar until light and fluffy, then stream in the melted butter slowly, whisking constantly to emulsify. Add the flour mixture in thirds and the yogurt in halves, alternating and stirring after each addition. Fold in the grated fruit and veggie. Pour into the prepared pan and bake for 35 minutes, or until a cake test comes out clean. Cool completely, and then frost. To prepare the frosting, beat together the butter and cream cheese until fluffy, then add the maple syrup a little at a time, beating until combined and fluffy. If you aren’t using it right away, store in a covered container in the fridge, and let stand at room temperature for half an hour and beat again until fluffy before using. Crush the cardamom and allspice, just until cracked and the pods inside the cardamom are exposed. Break up the cinnamon. Add spices and peel to a saucepan and add 4 cups of water. Bring to a simmer over medium heat, then cover and steep for 5-10 minutes. Strain into a teapot and serve with honey.